Attractive rental living in town – conversion as a chance. By all means secure – long-term cheap living on housing estates. High-end condominiums – new housing in the city centre. Housing cooperatives – individual and mutual planning and building. Data and facts with numerous charts on population development, relocation behaviour, mobility, social structure, choice of apartment, as well as an analysis of milieu, styles of home furnishing and key questions of living provide the basis for the discussion about the quality of living in the second stage of life. A book for interested individuals from the housing industry, architecture, urban planning, municipality, administration, politics and science, but also for all those who want to look into the quality requirements of getting old. Weeber+Partner (Hrsg.) 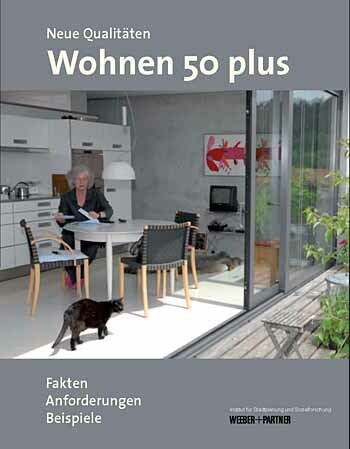 (2010): New Qualities – 50 Plus Living. Facts – Requirements – Examples. Ernst Wasmuth Verlag Tübingen/Berlin.